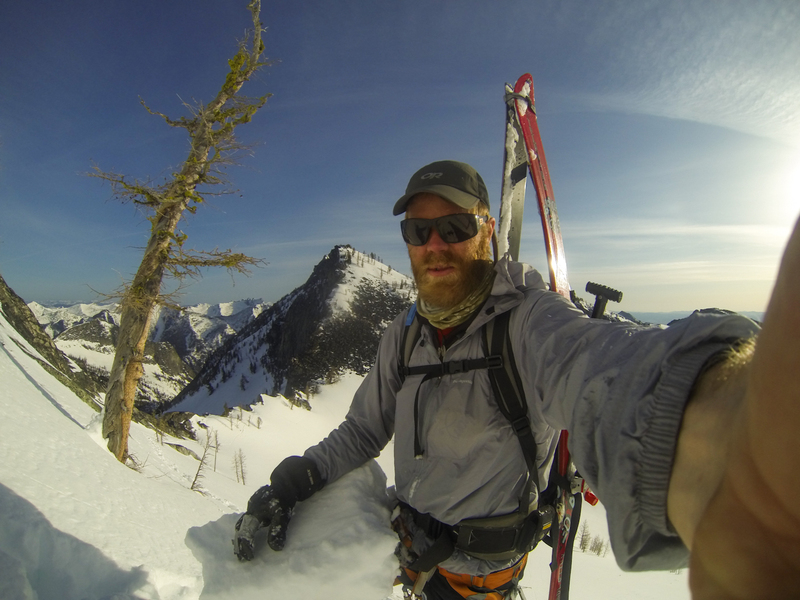 I returned to an old favorite spot the other day with the idea of descending a seldom-sought ski line off the northeast face of Canyon Peak above the Bitterroot Valley. This is another little peak that I cut my teeth on as a teenager, having put in a couple of epic days on this mountain over the period of a few years. The first time, Dylan and I scrambled up, unroped, cleaning old rap anchors as we went, wondering if you actually NEEDED a rope for the peak. Turns out you don’t need one (thankfully for us that day). That climb definitely got some adrenaline pumping, showed us some serious exposure, and provided one of those classic experiences that becomes a key event in my life as it pertains to mountains. 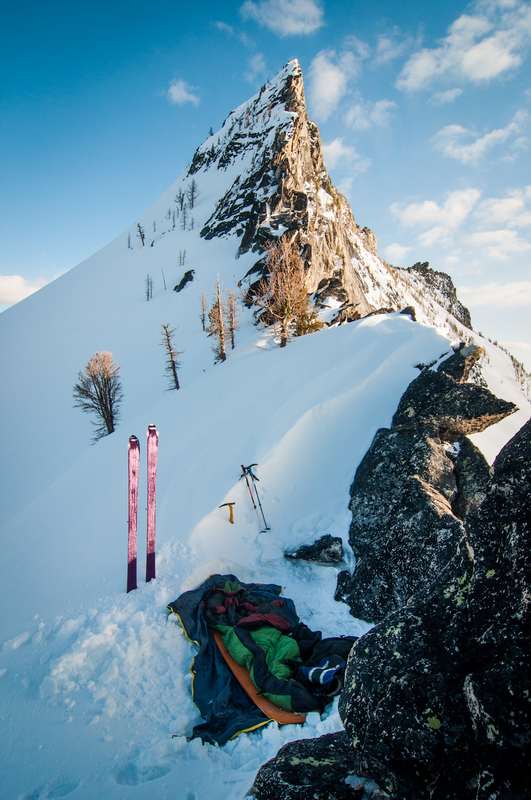 I skied in, navigating the normally heinous transition from dirt to snow, and made an open bivy high camp on the ridgeline below the summit pyramid. 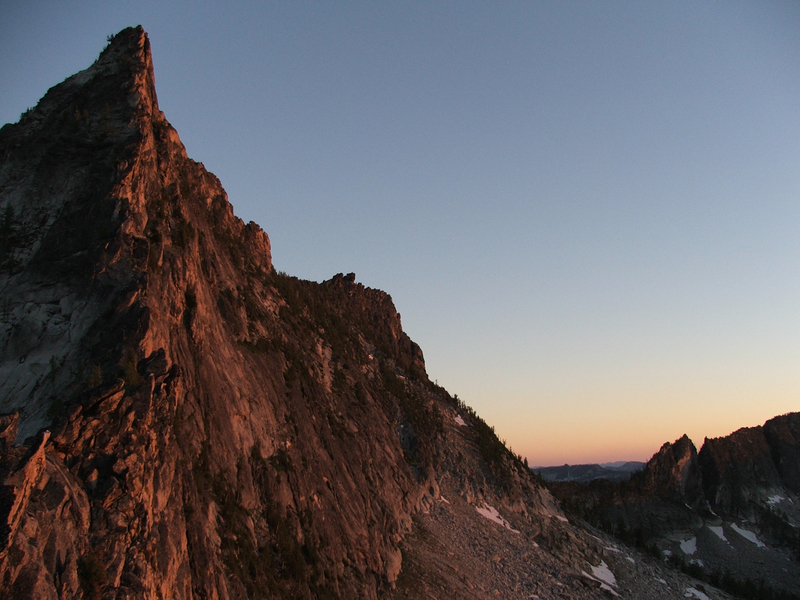 This is a spot I have watched a few sunsets from; it provides very late light, and great alpenglow on the North face of the peak, as well as nearly first light in the morning. I woke up to another bluebird day, tidied up camp and started to head up and across the apron towards the slot that provides passage to the upper face (just around the corner in the picture above). Being alone and hyper-aware of the risks of a steep and exposed climb/ski, I dug a few little pits as I made my way across the face. Not impressed by a hard layer that provided a clean shear from the last storm and wind activity on the ridge, I sat below the line I had hoped to ski, swapped my crampons for my skis, and called it a day. No reason to be reckless with instabilities in the snowpack while alone in a wilderness setting. Although disappointed, we must remind ourselves that no ski route is worth taking unnecessary risks for. It will be there next year, the year after, and many after that. Although I might not make it back to ski Canyon Peak next year or the year after, it will still be there when I do come back. Next up: off to Rainier with hopes of skiing the Fuhrer Finger. Tomorrow! Stay tuned for a report!